Dhaka, Dec 26 (Just News): The Anti-Corruption Commission (ACC) has not been able to prove the allegations brought against Bangladesh Nationalist Party (BNP) chairperson Begum Khaleda Zia with the evidences they presented at the court, claimed Khaleda Zia’s lawyer Abdur Rezzak Khan on Tuesday. “There is no substance in the lawsuit. ACC couldn’t prove the charges brought against Khaleda Zia with all the evidences it presented at the court,” he said after placing the third day’s arguments in favour of the former prime minister, Khaleda Zia, in the Zia Orphanage Trust graft case. Abdur Rezzak Khan presented his arguments before the Special Judges Court-5 on Alia Madrasa ground in old Dhaka around 3:45pm on Tuesday. ACC lawyer Mosharraf Hossain Kajal, talking to the media, claimed that ACC has successfully proved the charges against Khaleda Zia to be true. “We plead to the court for the highest punishment of Khaleda Zia,” Kajal said. BNP standing committee member Moudud Ahmed came up with a dissent. “This is a political case. None of the 32 witnesses of ACC could say Khaleda Zia misused power when she was the prime minister,” Moudud told newsmen after the court proceedings had ended in the afternoon. “The case was filed just to harass her. We hope Khaleda Zia will be acquitted from the charges in the case,” added the former law minister of the BNP government. 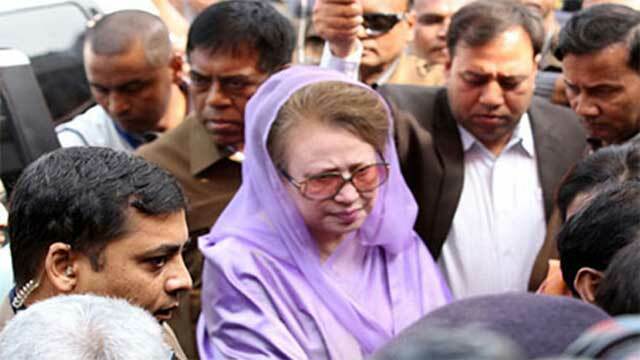 BNP chairperson Khaleda Zia appeared before the court at 11:24am and left around 4:00pm.